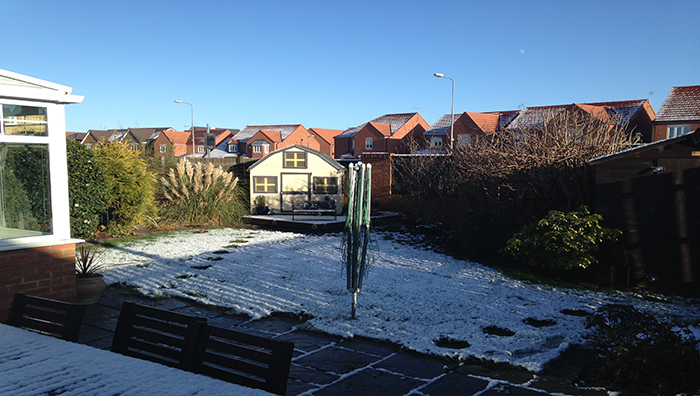 All Seasons Landscapes, run by Andrew McKie and based near Stockton on Tees, was approached to transform the compact garden of a semi-detached suburban property. The garden had an existing patio area which was starting to look tired, a large lawn area and overgrown planting. There was also a shed, playhouse and decking area which added further clutter to this small space. All Seasons’ clients were keen to remake their garden into something much more stylish, contemporary and easy to maintain while maximising as much space as possible. Andrew and the team significantly remodelled the garden, removing the structures and planting to create a simpler, cleaner area divided into unique spaces for entertaining, play and more. They rebuilt the patio area to the same dimensions as the existing patio, wrapping it around the conservatory of the house and adding in two stone-walled planters of different heights to separate the main patio space from the rest of the garden. They used gravel planting along one side of the garden to link the patio to a small paved area for seating, and added a feature planter in the opposite corner. The gravel planters used a stylish combination of classic topiary shrubs and contemporary ferns and hardy planting to give the garden a variety of textures and soften the lines of the paving and walling. One planter features a glittering spherical water feature, while the others include dramatic lighting to bring the garden to life at night. All Seasons used three separate Stonemarket products to create this modern garden, each complementing the others perfectly: Avant-garde walling and paving, Trident edgings and the beautiful Nordus Schwarz for the main patio space. Nordus Schwarz is one of our most dramatic paving products which makes an impact in traditional and contemporary gardens. It comes in two colour shades, the Nordus Gris green-grey and the Nordus Schwarz blue-grey – used here to contrast with the lighter tones of Avant-garde and Trident. A slate paving, Nordus has a natural clean-split surface and diamond sawn edges, that has been lightly brushed giving it a gorgeous texture and incredibly clean lines. Available in large format sizes, it’s ideal for bigger spaces or where you’re keen to create a statement. In this space, the deep colour of the Nordus Schwarz complements the variegated tones of the Avant-garde walling and adds a cool, crisp feeling to the vibrant colours of the textured planting Andrew McKie and the team have used. The garden is almost unrecognisable from its original overgrown state. All Seasons have stripped it back to create a luxurious and functional space, using a combination of richly-coloured stones and paving to create different areas in this small garden. By using cleverly placed planting, the team have divided the garden into clear spaces for play, seating and entertaining. Softer textures, like the water, turf and gravel, contrast effectively with the bold choice of paving materials, making it into a very tactile space. The combination of Nordus Schwarz, Avant-garde and Trident provide a cooling colour palette that works well with the red brick and timber fencing enclosing the garden. The mix of planting helps tie together the modern and the traditional, while still feeling stylish and elegant. The lighting is the final and finishing touch, extending the use of the garden into the evening and vividly highlighting its colours and textures. 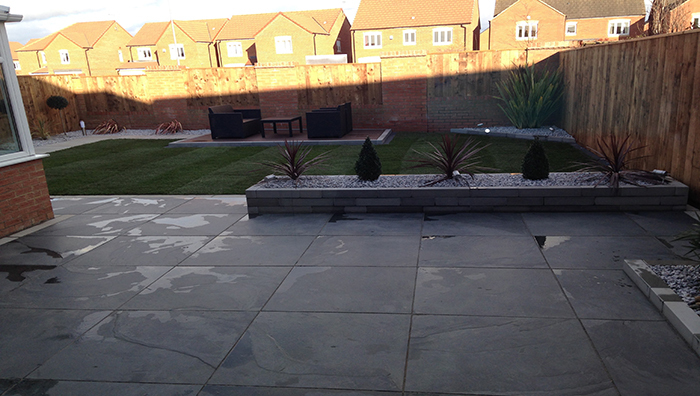 All Seasons Bespoke Landscapes are based near Stockton on Tees and work extensively with Stonemarket products to create beautiful paving, driveways and gardens for residential and commercial properties. They cover all aspects of garden design and build, including decking, paving and planting. Their designs often focus on creating individual spaces in one garden so clients are able to relax, entertain, play and enjoy in tailor-made areas.